Back when I was still in school, one of my girlfriends worked at a doughnut shop. She didn’t fry doughnuts (the newest employees had that job) or sell them (usually the lazier employees) — instead she got to decorate and fill. I used to be so envious of the doughnut filling machine. It looked SO FUN! If you’ve never seen a commercial doughnut filler, it works like this: there’s a giant well that sit on top of two tubes. You poke the tubes into the doughnuts, push the button (underneath the tubes) and the doughnuts are magically filled with a predetermined amount of filling. It was magical! It didn’t matter to me that she complained about the early hours, smelling like fried dough or getting frosting in her hair. I totally coveted her job. But one day after work (I worked at a boring bakery and deli just around the corner and we’d head home together), I grew even greener. The doughnut shop had a brand-spanking-new crêpe maker! I know this sounds incredibly nerdy, but I desperately wanted to play around with it. There was a ladle for the batter, one of those swirly wooden sticks to spread the batter out and even had a flat wooden stick to fold the whole thing up. Anyway, long story short, my friend let me make a crêpe once, after everyone went home. And it was just as fun as I dreamed it would be! It was spinach and feta crêpe and it was even more delicious because I made it. And that was the one and only time I made crêpes. Until yesterday. I’ve been wanting make a mini cake for the longest time. Mini cakes aren’t anything new, but with so many cute ones floating around (here, here, and here) I’ve been bit by the mini cake bug. I love baking, but I have a hard time waiting for things to cool. Crêpe cake to the rescue! Plus I got to go into zen mode and make crêpe after crêpe after crêpe. Sometimes I think I would really excel at factory work. This cake was actually incredibly easy to make, especially since I didn’t take the time to make my own lemon curd. 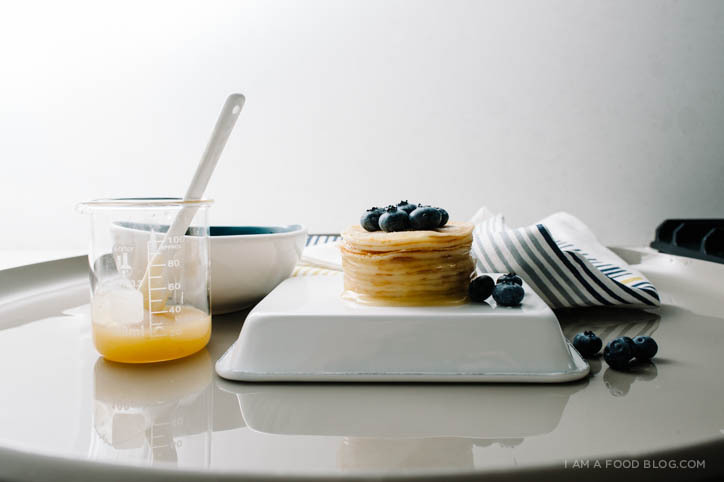 Super simple: lemon curd, blueberries and mini, mini crêpes. This was a happy little snack that totally made me feel like summer is on it’s way. And bonus, Mike liked it too! He’s really picky about desserts, but he actually enjoyed this one. 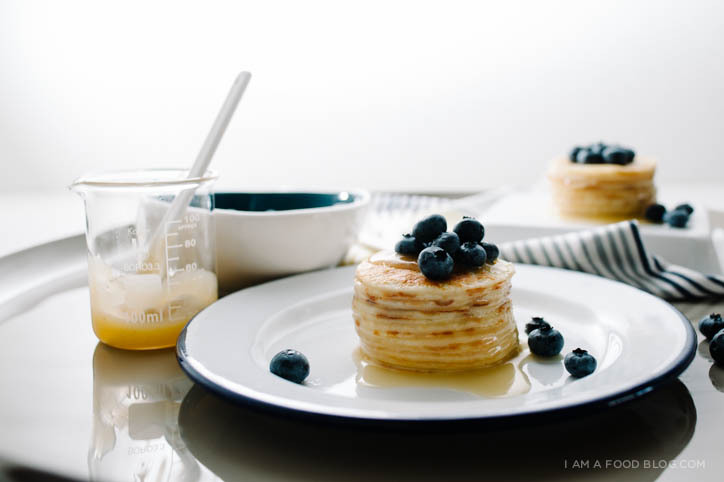 Oh, and if mini crêpe cakes aren’t you thing, you can definitely just make these as regular crêpes, and fill them with lemon curd and blueberries. They’ll taste just as good, without being too twee. Put the flour, eggs, milk, buttermilk, and sugar in a blender and blend into smooth. Most crêpe recipes suggest that you rest the batter for at least an hour or overnight. I was hungry and just went for it. Over medium to medium low, heat up a bit of oil or butter (I used oil) in a non-stick 8 inch frying pan. Add a scant 1/4 of batter and swirl to coat evenly. Cook until the edges are slightly brown and crispy, 2-3 minutes. Loosen the edges of the crêpe with a heatproof offset spatula and shake the pan. If the crêpe is cooked, it should move around in the pan a bit. Use the offset spatula, flip and cook until golden, about 1 minute. Set completed crêpe aside to cool (I placed parchment paper between my crêpes to prevent sticking). Continue to crêpe until you finish off your batter. Using a two inch cookie cutter, cut out crêpe rounds. I managed to get 3 mini crêpes from one big one. I snacked on the scraps right then and there, but you can save them and eat them later on with random toppings of your choice. When all of your mini crêpes are cut out, use the cookie cutter to stack up your cakes. Put your cookie cutter on a piece of parchment paper and place a crêpe inside the cutter and then add a 1/4-1/2 a teaspoon of lemon curd. Place another crêpe on top and lightly press down to smooth out the lemon curd underneath. Repeat until you’ve used half of your mini crêpes. To remove from the cutter, press down slightly on the top crêpe and pull the cutter up. Repeat with the remaining crêpes. Top with blueberries and enjoy! PS – Your first couple of crêpes will probably turn out pretty wonky. Don’t worry about it and keep crêpe-ing. You’ll soon get into the groove! Love lemon curd? Check these out: Raspberry Lemon Cake and Lemon Meringue French Toast. These look super cute! Everyone needs a friend in their life that works at a doughnut shop even if it’s to get the floor doughnuts and play with the kit. I never had any floor doughnuts…but sometimes she let me have fresh out of the fryer! Holy &*%* woman!!! 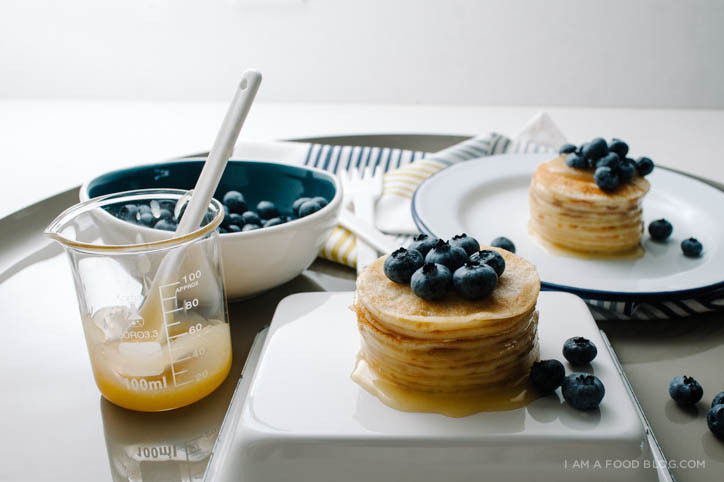 When I first saw these, I was like, HOW DID SHE MAKE THOSE PERFECT-LOOKING CREPE STACKS?! Cookie cutter = so brilliant. I. Adore. These. As much as I’d love to just stuff crepes in my face as soon as I make them, I whole-heartedly applaud the effort to make them into gorgeous mini cakes prior to consumption (note to self: acquire self-control). SO BEAUTIFUL. And lol I can’t say I’ve ever had a desire to work at a doughnut shop before, but you’re making me want to give it a try–or at least make the cute man who runs his own crepe food truck give me a shot at using his little crepe spreader tool (that does look really fun). yes, my secret is out….cookie cutters!! and i think you should totes ask the cute man with the crepe truck if you can have a go!! man…i want a crepe machine! OH MY GAH THESE ARE SO CUTE. i’ve always wanted to make a crepe cake but have been so intimidated by the though of having to make many many big crepes without ripping them. but these, i think i could try without being too messy. also, in response to your instagram comment: U. ME. VEGAS IN MAY. EATING CONTEST. i ripped one as i was making them and i was like…NOOOOOOOO. and mike was all like, what’s the big deal, you’re cutting them up anyway. but it was the principle of the ripped crepe! U. ME. VEGAS. IT’S ON LIKE DONKEY KONG! I’m in major love with these..I must now make crepes cakes because these are straight up legit..
thanks for the recipe Erika!! i went with the blender way, but i LOVE how you did both. super helpful girl! Yes please! 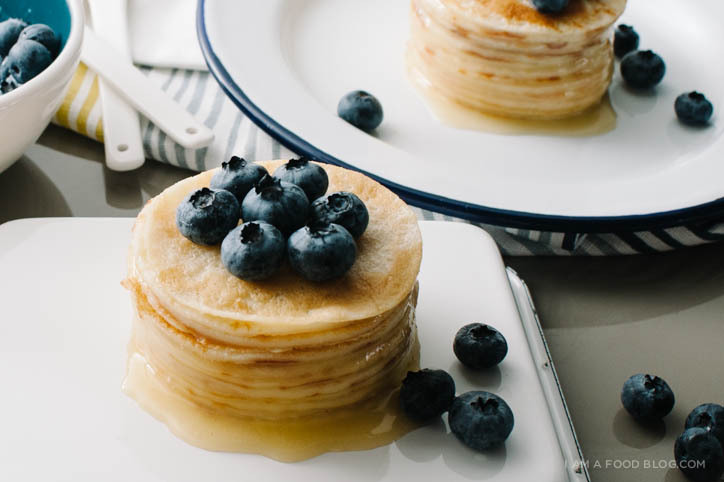 These crepe cakes are so cute, and obviously SO good. I definitely need to get my hands on some blueberries now! Mini cakes are so freaking cute! I love you for this recipe. It looks freaking perfect! Wow, this looks adorable and delicious! 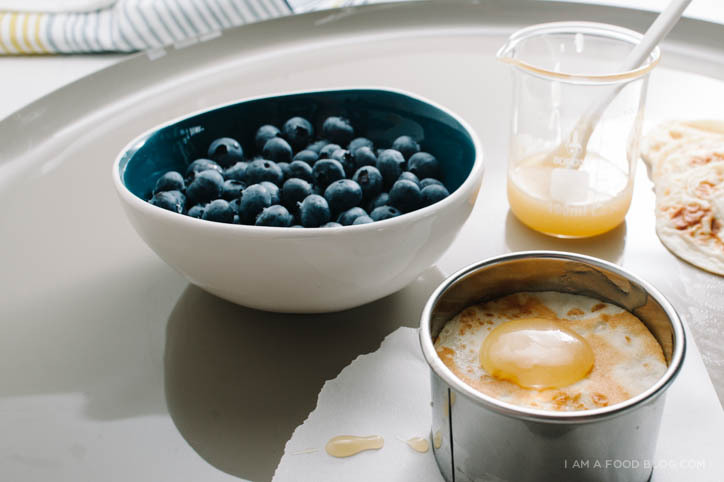 I love blueberries and lemons together, and this is such a perfect, creative use for lemon curd. 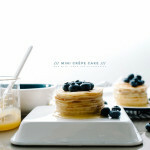 I’ve never made a crepe cake because it seems like SO MUCH WORK to stand there forever and painstakingly make so many large, perfect crepes, but a mini crepe cake must be so much more do-able! (And then I also wouldn’t have to worry about slicing into a giant crepe cake and the potential disaster that could ensue with that…) I love it. hahaha i’m weird in that i LOVE standing at the stove making the same thing over and over again. using a mini pan helps too! SO CUTE! My great-granny made crepes, I remember watching her flip the panckes with her fingers right into the pan — no sissy hands on my granny. I love the lemon curd here and the tiny cakes make the blueberries look HUGE! Those fancy crepe making machines are awesome – I can see why you were desperate to try it!! 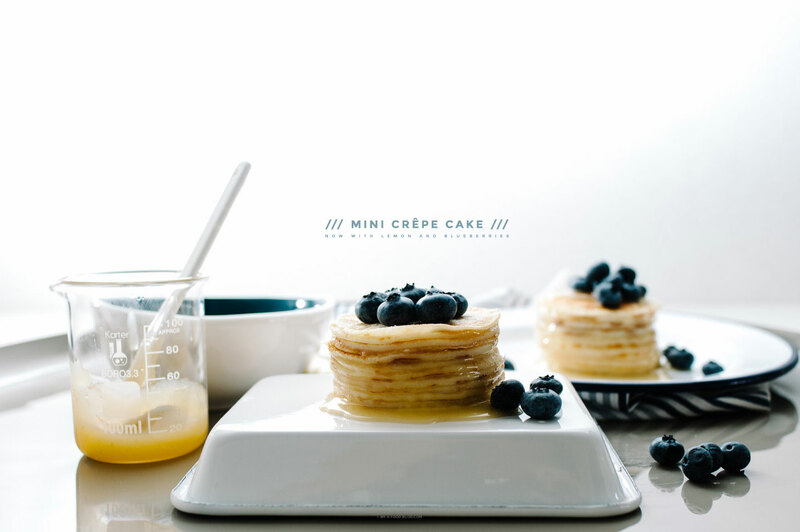 This mini crepe cake is so cute and looks so delicious!! I love your pictures too – pinning! 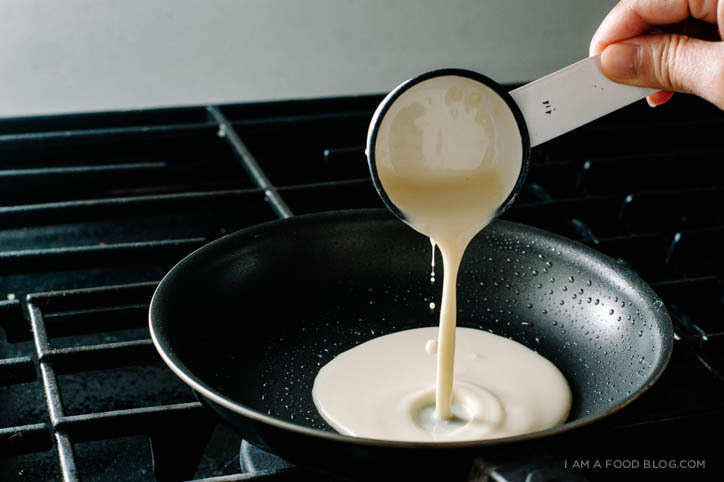 LOVE this idea!I will try these!I love to make crepes, but haven’t in a while. This is great for just 2 people.When our kids were young, I made them alot! Thank you for posting this wonderful recipe!!! THIS LOOKS SO GOOD. And I love love love lemon curd! Wow! This is adorable! It looks delicious! JUST MADE THESE THEY ARE AMAZING!!!!!! Sometimes I think I would really excel at factory work. <– that made me laugh! I know what you mean because some repetitive actions are zen like to me too. Just came across your blog today and love the recipes I'm seeing. Will definitely be give some a try – especially this one! This recipe is like a mini version of Mille crepe. If you don’t know what that is, it’s layers of crepe stacked like a cake with cream and sometimes with fresh fruit.